Two Words You Can’t Live Without ! 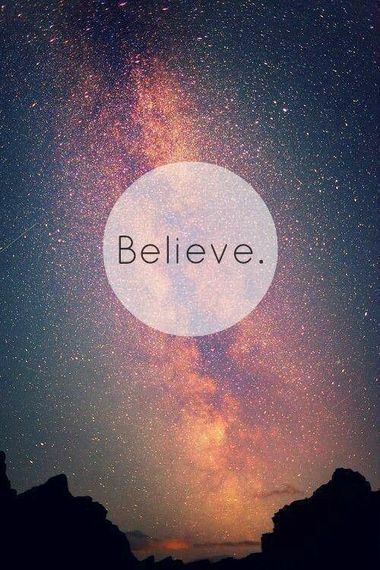 There is so much power that comes with these two words: I BELIEVE. When we believe in something, we care about it, we love it and we desire it. We accept it has our truth. This is heart work, no matter how many mantras or affirmations we say,all of it will be null and void without Belief. Oh how powerful is it when we put those two words before something !!! How powerful is it when we just say the words alone. It stretches us in the direction of our Truth. It gives weight to the higher authority outside of us. When we say that we BELIEVE in something, we automatically connect with the Divine. When we say we BELIEVE in others, we automatically connect with the Divinity within them. And, when we say we BELIEVE in ourselves, we call on the Divinity within our being. Believing activates us. It is the seed of truth. Believing allows us to take small but might steps into manifesting our destiny. If you stop and think about any desire you have ever manifested in your life. What does it start with ? At some point you whispered to yourself…. I BELIEVE. Or you told someone with conviction-I BELIEVE ! Just a simple phrase. But it carries so much Divine energy. Now, you see this is a gift, this is power. Believing activates us, it causes us to move in the direction that we desire, which in turns opens up the universe. The atmosphere responds to our actions, to our beliefs. Mantras and Affirmations aid in our mindfulness, but Belief comes from Soul, it comes from Heart and it transforms our Minds. It set’s us up to manifest that which we desire. These powerful words- I BELIEVE- is the seed of Truth. What we desire can not shift into reality without it. So, when you are dealing with unbelief, simply pray for it. That’s it, pray about your unbelief. Sprinkle some love on it. Believing in Big things requires us to stretch and it can get pretty uncomfortable. Just know that you are one step away from making that thing your reality. The future belongs to those, who BELIEVE in the beauty of their Dreams.~Eleanor Roosevelt.